Degradation Rate of 5-Fluorouracil in Metastatic Colorectal Cancer: A New Predictive Outcome Biomarker? Botticelli A, Borro M, Onesti CE, Strigari L, Gentile G, Cerbelli B, Romiti A, Occhipinti M, Sebastiani C, Lionetto L, Marchetti L, Simmaco M, Marchetti P, Mazzuca F.
Predictors of mood disorders in cancer patients’ caregivers. Mazzotti E, Sebastiani C, Antonini Cappellini GC, Marchetti P.
Patient perception of disease control and psychological distress. 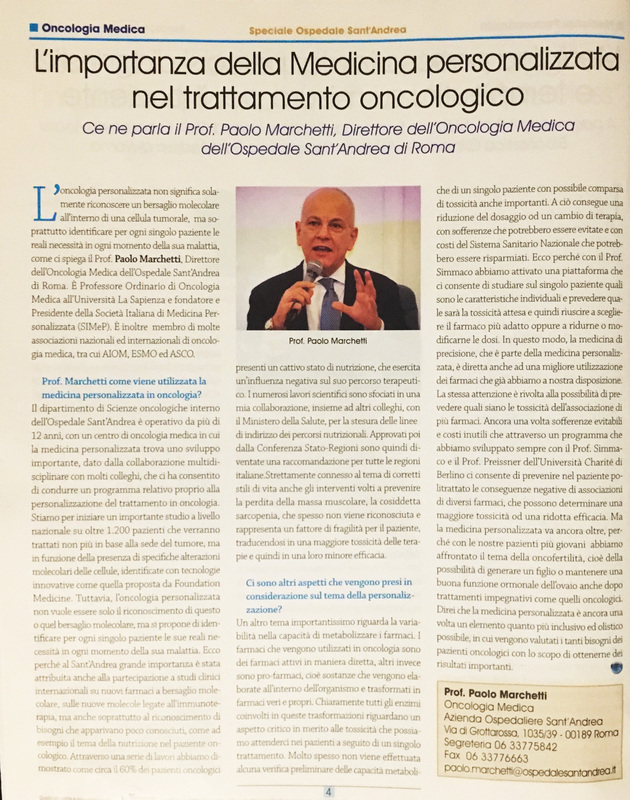 Mazzotti E, Sebastiani C, Marchetti P.
Treatment-related side effects and quality of life in cancer patients. Mazzotti E, Antonini Cappellini GC, Buconovo S, Morese R, Scoppola A, Sebastiani C, Marchetti P.
Predictors of existential and religious well-being among cancer patients. Mazzotti E, Mazzuca F, Sebastiani C, Scoppola A, Marchetti P.
Intradermal lymphoscintigraphy at rest and after exercise: a new technique for the functional assessment of the lymphatic system in patients with lymphoedema. Tartaglione G, Pagan M, Morese R, Cappellini GA, Zappalà AR, Sebastiani C, Paone G, Bernabucci V, Bartoletti R, Marchetti P, Marzola MC, Naji M, Rubello D.